I think it's fitting to begin our top 10 countdown with a rendition of "The Blues." With all due respect to jazz, I have yet to hear a good version of the blues that actually laments the state of the ocean (if anyone has evidence to the contrary, post to the comments below! I'd love to hear it!). In terms of the Phoenix Islands, there are lots of ways to interpret "The Blues." First, I miss being on a boat and seeing nothing but blue--blue sky, blue sea. No land, or birds, or other boats. Just blue. In fact, most of the Phoenix Islands Protected Area (PIPA) is just blue. With an area of 410,500 km2, PIPA is the largest Marine Protected Area (MPA) in the world, and is the first MPA in the Pacific to include large areas of deep water habitat including seamounts (of which Kiribati has around 4% of the world's total). We explored the seamounts with an ROV, but I'll save the details, since the ROV has also made the top 10. The Phoenix Islands are located in extremely deep ocean waters (>5,000m), most of which is just blue. PIPA is an important "ocean desert," to quote Larry. More specifically, to directly quote Kate quoting Larry: "Dives in the surface water of the tropical ocean are very different from some dives I've made in the North Atlantic," Larry said, "where sometimes we've seen salps and jellyfish in swarms of thousands. 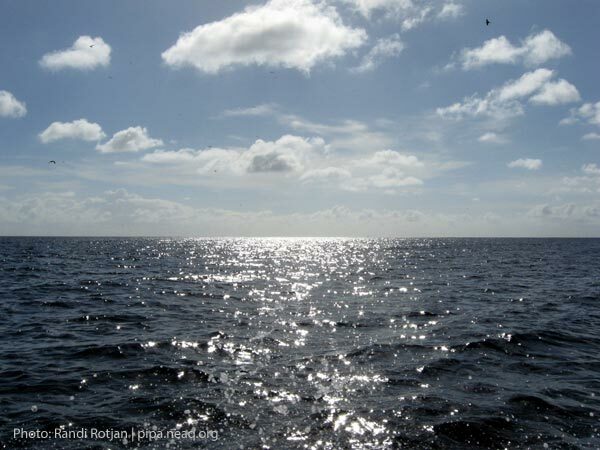 The reason is that the ocean here has only low levels of the nutrients that plankton need, such as nitrogen. Without it, phytoplankton (microscopic plants) can't grow, and there's little food for bigger plankton. It's almost an ocean 'desert.'" Now, terrestrial deserts are anything but boring. Though they are relatively sparse, there are still some incredibly important and interesting desert critters... so too in the oceans. However, we know very little about life in blue deserts. That is why Larry's work on gelatinous plankton in PIPA is so important. The majority of the ocean is blue and represents one of the last unexplored frontiers for humanity. Far from sadness, these blues represent excitement and adventure. So, bring on the blues! Let's respectfully explore our oceans, and try to understand and conserve what we have. Let's embrace the concept of living blue. And while I'm sad that the expedition is over, I think singin' the blues is just fine... I'll be walking the bass line from the shore line for a while.